Author of Futuretainment and CEO of innovation research agency Tomorrow, Mike Walsh helps to prepare business leaders for what’s next. Everything is changing. All the traditional industries we grew up with – media, communication, finance, professional services and retail – are all in the process of being turned upside down and re-invented. The force behind this revolution is not technology but rather consumer behaviour. After all, as interesting as it is when things change, the real magic happens when people do. A leading authority on new media and the digital future. Mike’s unique approach is to scan the near horizon for what’s happening right now, then translate these movements into usable trends. Constantly traveling the world for the best ideas, consumer innovations and disruptive technologies – Mike distills the most relevant insights into tailored keynotes that allow any audience (including technophobes) to not only understand, but also start to influence the future direction of their industry. 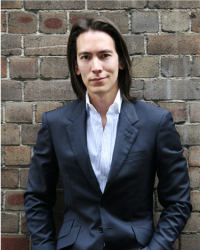 With a dynamic and high energy presentation style, author and futurist Mike Walsh currently stimulates audiences around the globe with his analysis of the latest consumer trends. His presentations blend video, high impact visuals and mind blowing cases of innovation from his experiences in the cutting edge markets of Japan, Korea and China. Whether a conference, strategy offsite or an intimate boardroom discussion – Mike’s presentations will turn the overwhelming tidal wave of new media opportunities into practical strategy. Acting as a powerful catalyst for new innovation, strategic planning and brand inspiration. Mike Walsh has three core programs, which are constantly updated with the latest case studies and field reports from his extensive global research program. The programs focus on three areas of your immediate future – what’s next for your customers, your company and the world. Each program can be delivered as either a one hour keynote, or an extended half day workshop with interactive exercises. Welcome to the Revolution. The balance of power has shifted and consumers have taken control. To win the hearts and minds of tomorrow’s customers requires new mindsets, new tools and a new set of maps to navigate the behavioural patterns of a global generation born mobile. Based on Mike Walsh’s best selling book, FUTURETAINMENT is a fast paced tour of the latest technologies, global trends, and case studies that will forever change the way you think about your relationship with your customers. What does it take to lead a 21st century company? New technology is not only an opportunity to improve productivity, it invites us to ask a much bigger question – can we re-imagine the way we do business? Forces of change surround us. Whether it be generational turnover, the Cloud, mobile work, or the rise of the social enterprise – the companies that thrive in the near future will be the ones that not only embrace change but are the first to break the rules. With original consumer market research, practical evaluations of next generational enterprise tools and case studies from some of the world’s most innovative firms – you will have everything you need to start thinking like a FLEX firm. There is a new war coming – over the future’s most valuable asset. Big Data, once just the domain of technology professionals, will soon be the number one issue for all business leaders. Consumers are producing more of it, marketers are starting to leverage it, and governments are seeking to control it – and most importantly, business leaders will be asked to make decisions based on it. With original research, practical evaluations of disruptive strategies and case studies from some of the world’s most innovative firms, Mike Walsh’s keynote presentation will give you the roadmap you need to set your Big Data strategy in place for 2013. Social unrest, economic turmoil, rapid technological change – we live in a world seemingly dominated by crisis. And yet if you look more closely, you may also see a different set of patterns giving rise to new markets, new consumers and new ways to do business. The future is already here, you just need to know where to look. From disruptive mobile technology from China to India’s low cost business models, next generation mobile banking in Africa and social consumerism in South America – innovation is shifting to a new geography. How we interact, transact and entertain ourselves in the future will be shaped by a billion new consumers from emerging markets. WORLD NEXT is your roadmap to understanding and accessing the growth potential of tomorrow’s world.